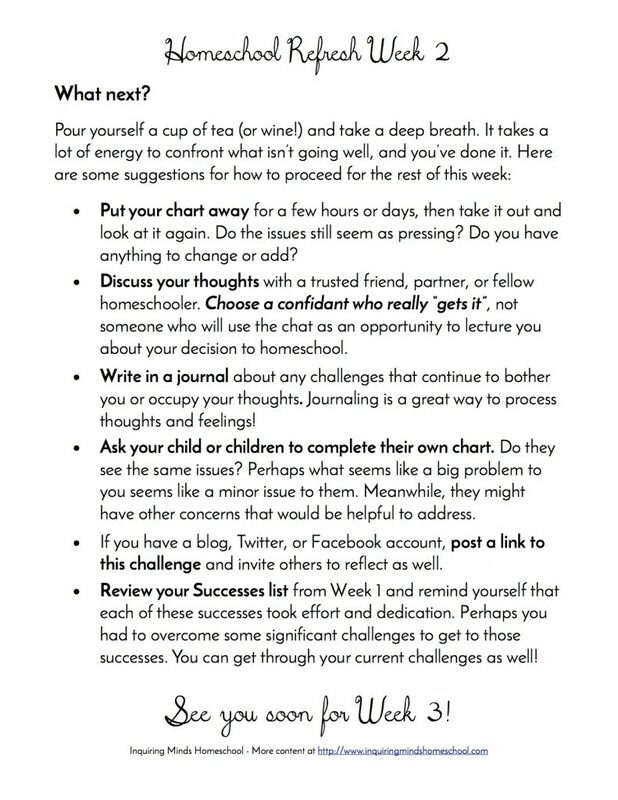 This week, we’ll be taking an honest look at our homeschool challenges. Before we go off setting goals and thinking about how to change things up, we need to first take an honest look at what exactly the difficulties ARE. That way, we can be sure that the changes we make will actually address the problem! If you signed up for the Homeschool Refresh already, you got Week 2 sent straight to your email inbox. If you haven’t signed up yet, no worries! You can do that by clicking any image or link on this page, like this one: Send me my free worksheets! My Week 2, filled out in the PDF. You can also print out your worksheets and write directly on them. It’s up to you! 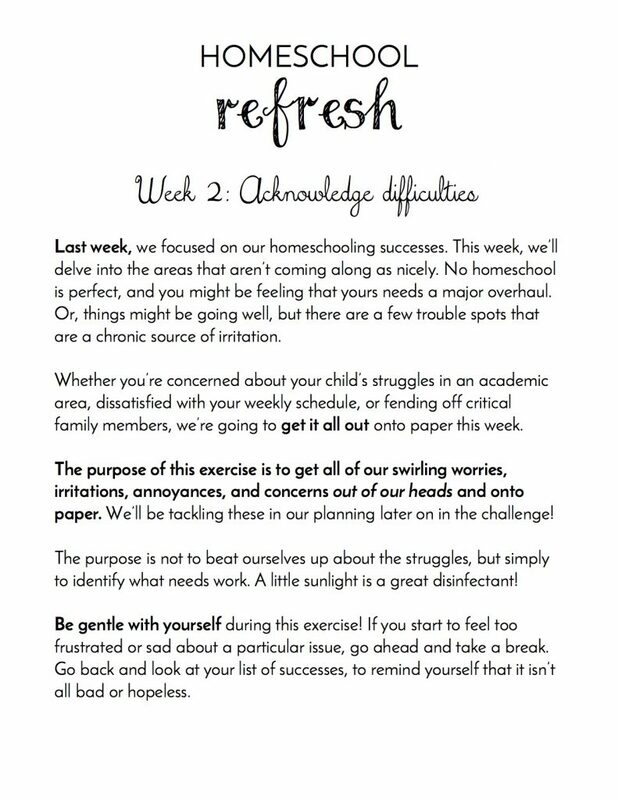 In the worksheets for this week, you’ll identify areas of difficulty, and specific examples of progress or difficulties in these areas. 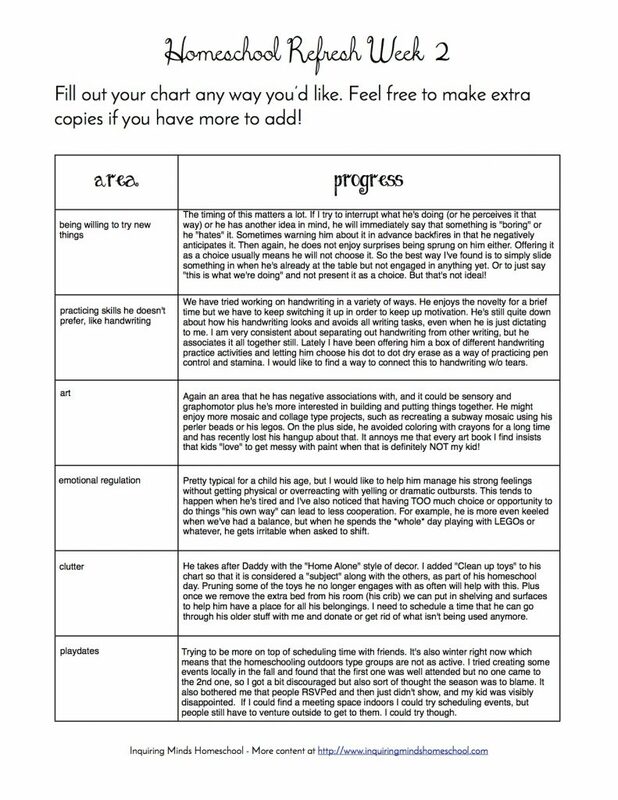 The worksheet says “Progress” because even in these challenging areas, you might be seeing glimmers of improvement. We don’t want it to be all doom and gloom. Acknowledging that homeschooling isn’t 100% sunshine and unicorns is a tricky business. You may have people in your life who give you a hard time about your decision to homeschool. 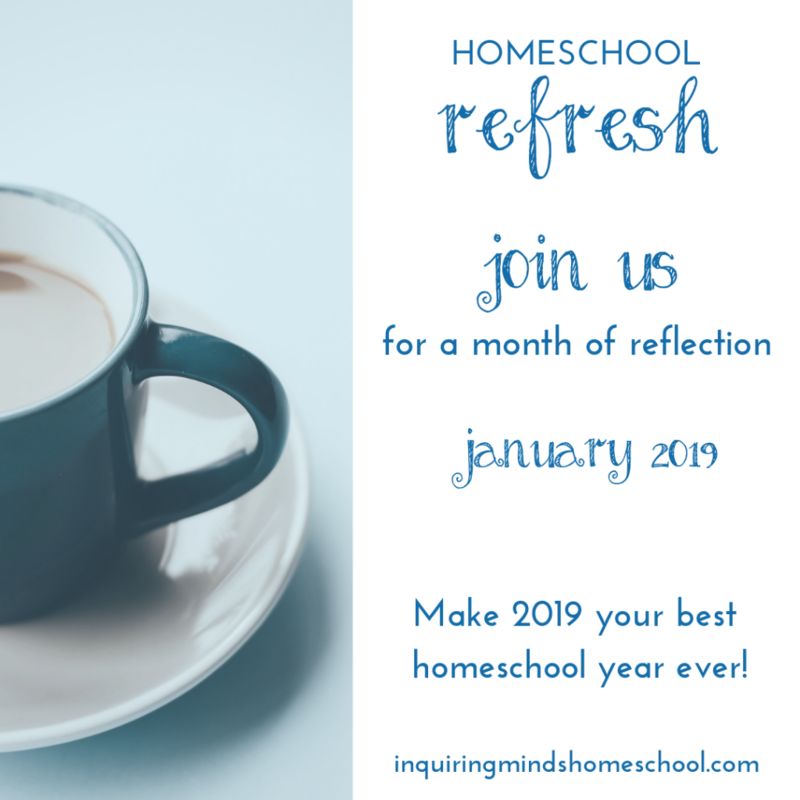 So, you might be in the mode of defending your homeschool against every possible attack. The critics in your life (this includes online life, btw) might not get your decision making process or see the benefits that you wrote about in Week 1. But, amidst all their mistakes and confusion, it’s possible that they have stumbled upon a few grains of truth. For example: your mother in law might ask you every time there’s a family gathering about why your older child isn’t reading yet. You know she isn’t a big fan of homeschooling and that she’s probably just asking to let you know of her disapproval, disguised as her “concern”. She doesn’t really want to know – she’s just concern trolling. If you’re really honest with yourself, it might legitimately bug you that your older child isn’t reading yet. Deep down, you might be worried about it. You can see that he’s getting bored with the books he can sound out on his own, but easily gets frustrated when he tries to read the books he really wants to read. You’ve even had stray thoughts about bringing it up with the pediatrician, or asking your teacher friend who works with struggling readers. It’s just that every time you think about it, you remember the “concern” from your mother in law. It makes you want to roll your eyes and rattle off all the reasons why Finland doesn’t teach reading early, or all the other arguments that you’ve used thus far to push your worries away. 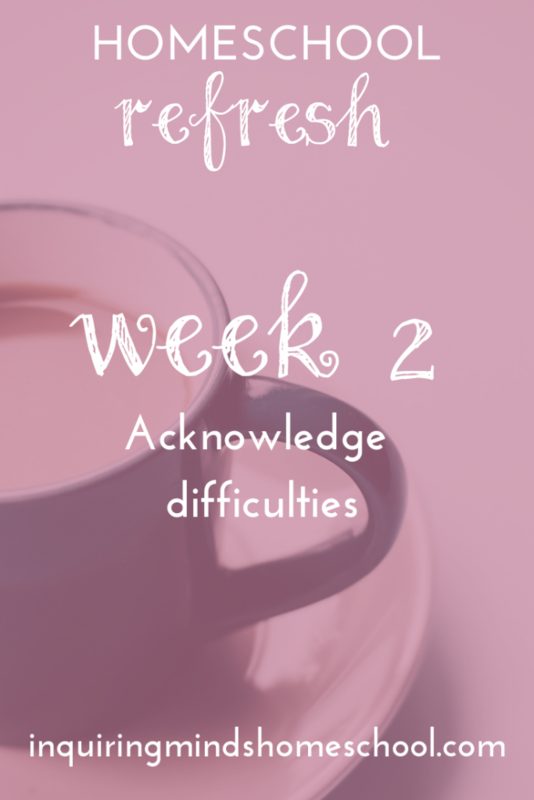 For Week 2 to work, we have to treat our concerns honestly, but not beat ourselves up. Or hear the concerns spoken in the voices of our critics. It doesn’t matter whatsoever if a critical person in your life points out “concerns”. It does matter if YOU think it could be a problem, or if your child thinks it’s a problem! The goal of this is to identify areas for problem solving and brainstorming, NOT to feel badly! 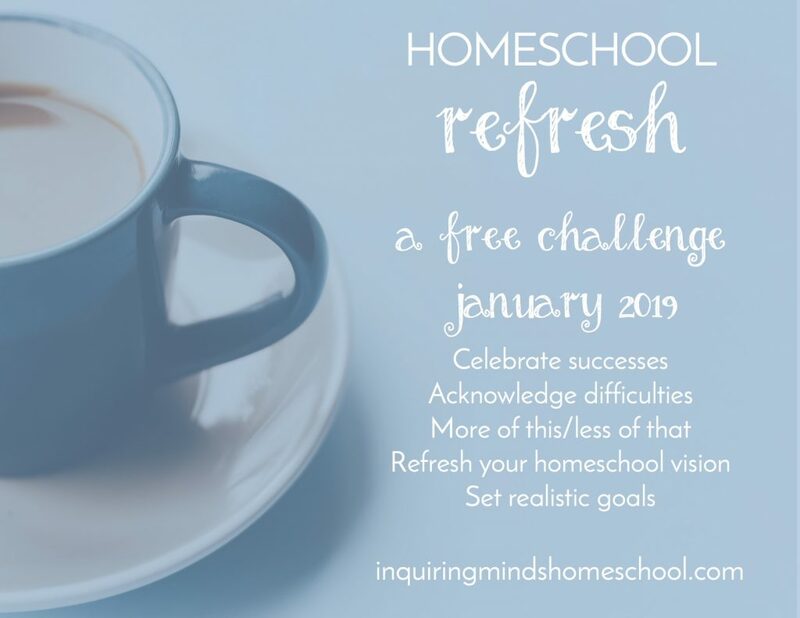 The fact that you’re taking the time to do this process means that you are a wonderful homeschooler, despite whatever struggles you’re having.